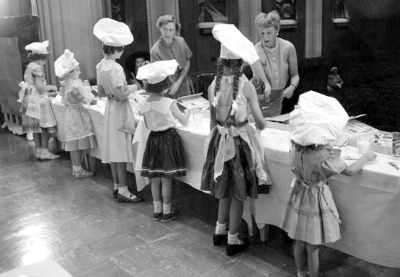 Delightfully dressed in fifties' finery for a baking contest in 1953. How appropriate for #NationalDessertDay. This is how we did it in the fifties. Ruffled dresses, rick rack trimmed skirts, eyelet lace pinafores with wide sashes, and Mary Jane shoes were common attire. Read more about Fifties Fashions for Little Girls HERE.